3.8.2 How do I update RStudio? 4.2 Why should scientists use Github? 4.2.1 What are Git and Github? 6.5 filter() subsets data row-wise (observations). 6.16.1 Error: unexpected SPECIAL in " %>%"
9.10 How do you avoid merge conflicts? Why do we start with data visualization? Not only is data viz a big part of analysis, it’s a way to SEE your progress as you learn to code. This lesson borrows heavily from Hadley Wickham’s R for Data Science book, and an EcoDataScience lesson on Data Visualization. Packages are bundles of functions, along with help pages and other goodies that make them easier for others to use, (ie. vignettes). So far we’ve been using packages that are already included in base R. These can be considered out-of-the-box packages and include things such as sum and mean. You can also download and install packages created by the vast and growing R user community. The most traditional place to download packages is from CRAN, the Comprehensive R Archive Network. This is where you went to download R originally, and will go again to look for updates. You can also install packages directly from GitHub, which we’ll do tomorrow. You don’t need to go to CRAN’s website to install packages, we can do it from within R with the command install.packages("package-name-in-quotes"). We are going to be using the package ggplot2, which is actually bundled into a huge package called tidyverse. We will install tidyverse now, and use a few functions from the packages within. Also, check out tidyverse.org/. install.packages("tidyverse") ## do this once only to install the package on your computer. When you do this, it will tell you which packages are inside of tidyverse that have also been installed. Note that there are a few name conflicts; it is alerting you that we’ll be using two functions from dplyr instead of the built-in stats package. install.packages() is setting up electricity for your house. Just need to do this once (let’s ignore monthly bills). library() is turning on the lights. You only turn them on when you need them, otherwise it wouldn’t be efficient. And when you quit R, it turns the lights off, but the electricity lines are still there. So when you come back, you’ll have to turn them on again with library(), but you already have your electricity set up. You can also install packages by going to the Packages tab in the bottom right pane. You can see the packages that you have installed (listed) and loaded (checkbox). You can also install packages using the install button, or check to see if any of your installed packages have updates available (update button). You can also click on the name of the package to see all the functions inside it — this is a super helpful feature that I use all the time. Copy and paste the code chunk below and read it in to your RStudio to load the five datasets we will use in this section. ggplot2 is a plotting package that makes it simple to create complex plots from data in a data frame. It provides a more programmatic interface for specifying what variables to plot, how they are displayed, and general visual properties. Therefore, we only need minimal changes if the underlying data change or if we decide to change from a bar plot to a scatterplot. This helps in creating publication quality plots with minimal amounts of adjustments and tweaking. ggplot likes data in the ‘long’ format: i.e., a column for every dimension, and a row for every observation. 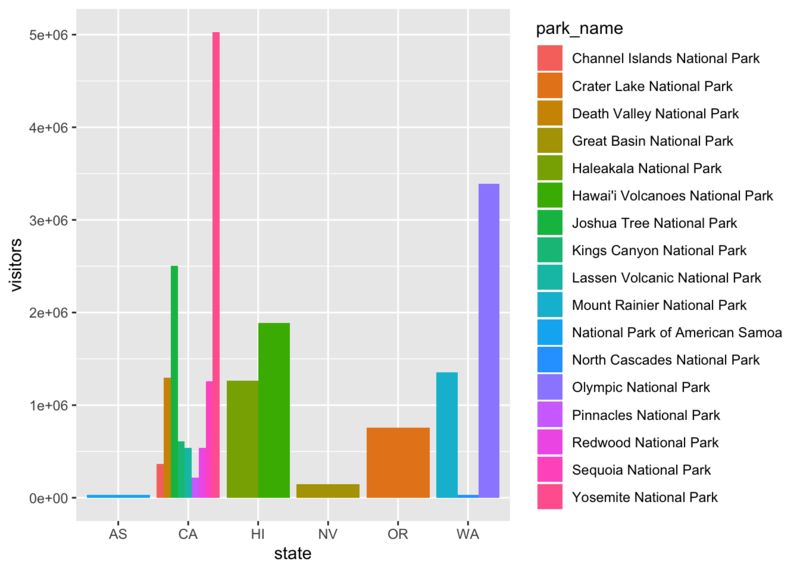 Well structured data will save you lots of time when making figures with ggplot. 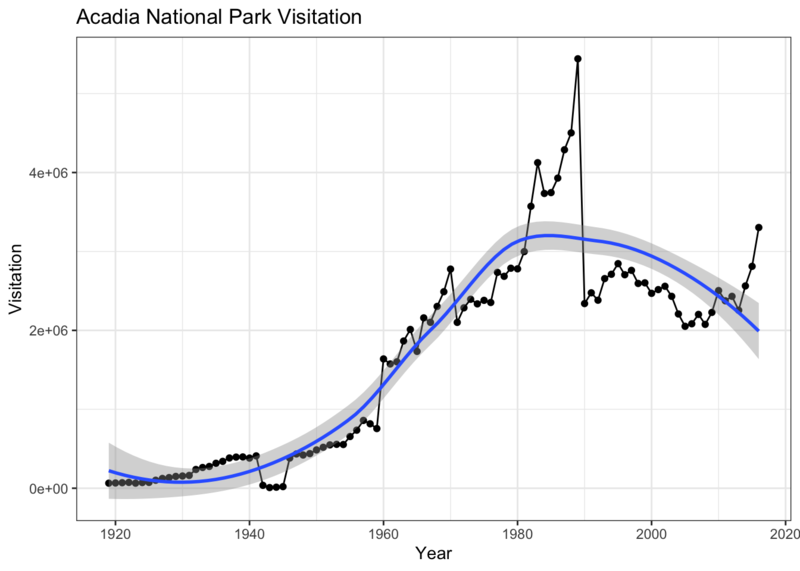 We are going to use a National Park visitation dataset (from the National Park Service at https://irma.nps.gov/Stats/SSRSReports). Read in the data using read_csv and take a look at the first few rows using head() or View(). region, US region where park is located. geom_line() for trend lines, time-series, etc. Anything you put in the ggplot() function can be seen by any geom layers that you add (i.e., these are universal plot settings). This includes the x and y axis you set up in aes(). You can also specify aesthetics for a given geom independently of the aesthetics defined globally in the ggplot() function. The + sign used to add layers must be placed at the end of each line containing a layer. If, instead, the + sign is added in the line before the other layer, ggplot2 will not add the new layer and will return an error message. Now, let’s capitalize the x and y axis labels and add a main title to the figure. I also like to remove that standard gray background using a different theme. Many themes come built into the ggplot2 package. My preference is theme_bw() but once you start typing theme_ a list of options will pop up. The last thing I’m going to do is remove the legend title. In addition to theme_bw(), which changes the plot background to white, ggplot2 comes with several other themes which can be useful to quickly change the look of your visualization. 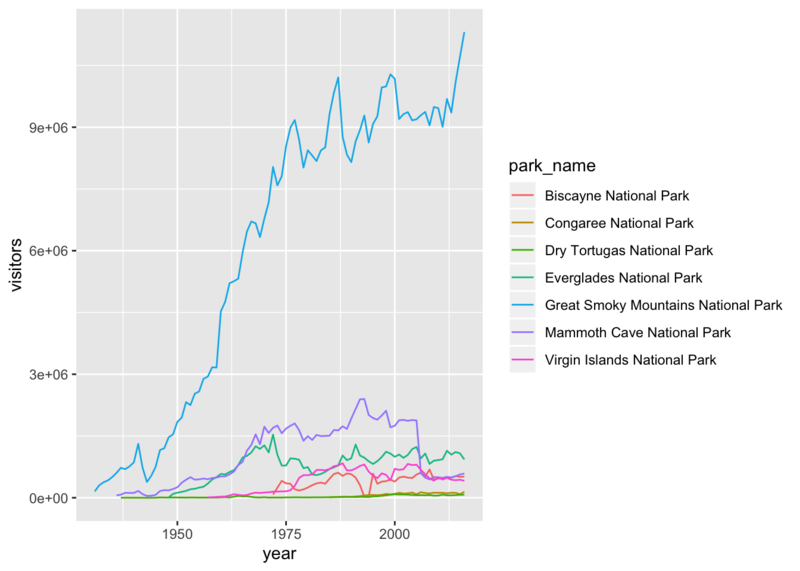 Using the se dataset, make a scatterplot showing visitation to all national parks in the Southeast region with color identifying individual parks. 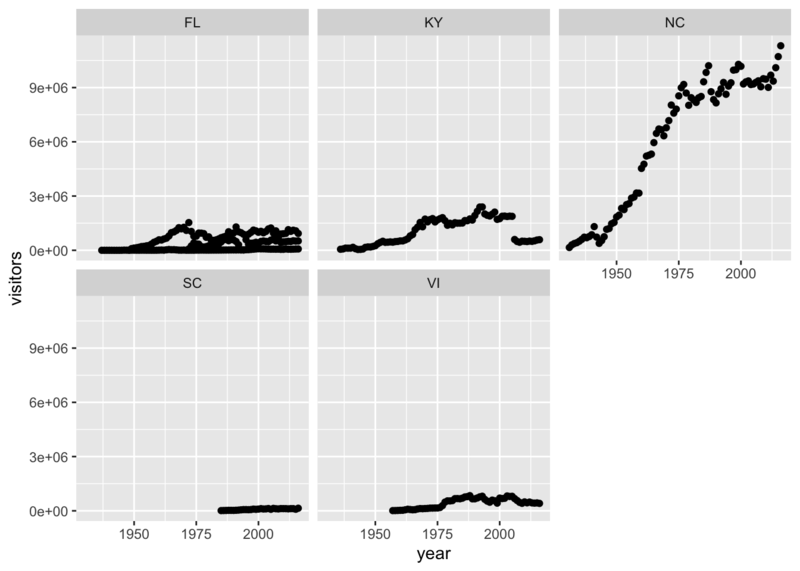 Change the plot so that color indicates state. Customize by adding your own title and theme. You can also change the text sizes and angles. Try applying a 45 degree angle to the x-axis. Use your cheatsheet! In the code below, why isn’t the data showing up? The code is missing a geom to describe how the data should be plotted. A geom is the geometrical object that a plot uses to represent data. People often describe plots by the type of geom that the plot uses. For example, bar charts use bar geoms, line charts use line geoms, boxplots use boxplot geoms, and so on. Scatterplots break the trend; they use the point geom. You can use different geoms to plot the same data. 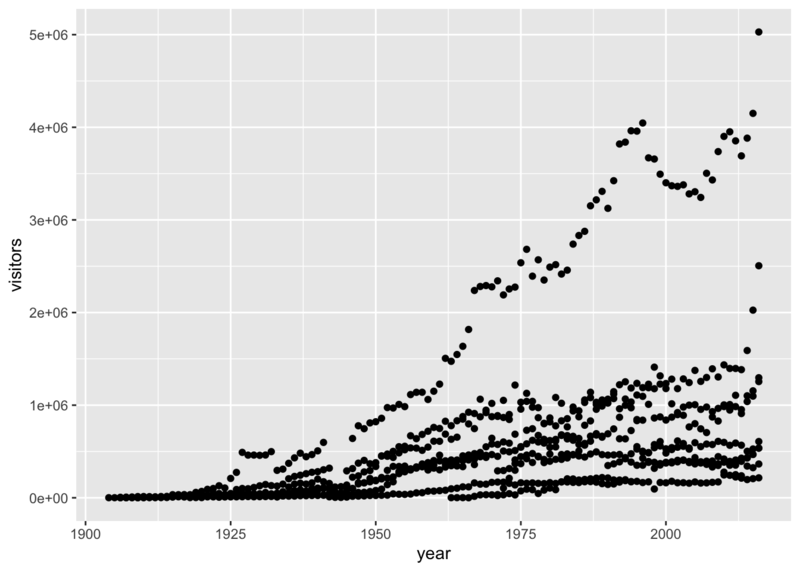 To change the geom in your plot, change the geom function that you add to ggplot(). 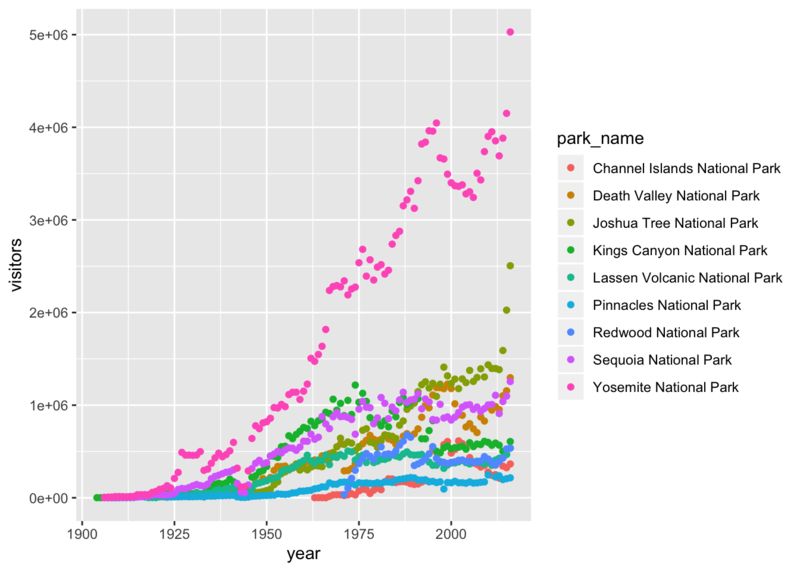 Let’s look at a few ways of viewing the distribution of annual visitation (visitors) for each park (park_name). None of these are great for visualizing data over time. We can use geom_line() in the same way we used geom_point. ggplot2 provides over 30 geoms, and extension packages provide even more (see https://www.ggplot2-exts.org for a sampling). 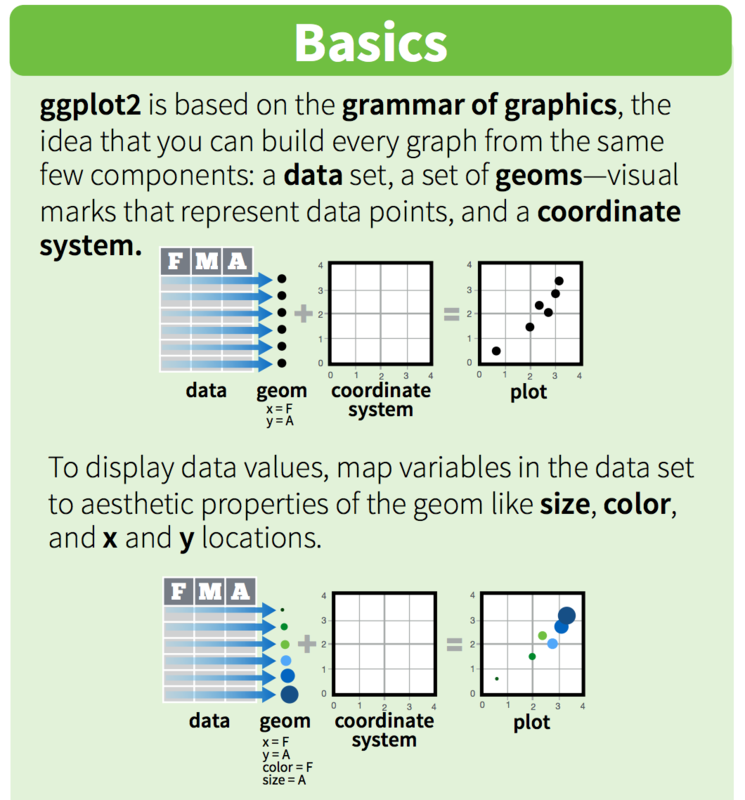 The best way to get a comprehensive overview is the ggplot2 cheatsheet. To learn more about any single geom, use help: ?geom_smooth. Notice that this plot contains three geoms in the same graph! Each geom is using the set of mappings in the first line. ggplot2 will treat these mappings as global mappings that apply to each geom in the graph. If you place mappings in a geom function, ggplot2 will treat them as local mappings for the layer. It will use these mappings to extend or overwrite the global mappings for that layer only. This makes it possible to display different aesthetics in different layers. With all of this information in hand, please take another five minutes to either improve one of the plots generated in this exercise or create a beautiful graph of your own. Use the RStudio ggplot2 cheat sheet for inspiration. See if you can change the thickness of the lines or line type (e.g. dashed line). Can you find a way to change the name of the legend? What about its labels? Next, let’s take a look at a bar chart. Bar charts seem simple, but they are interesting because they reveal something subtle about plots. Consider a basic bar chart, as drawn with geom_bar(). 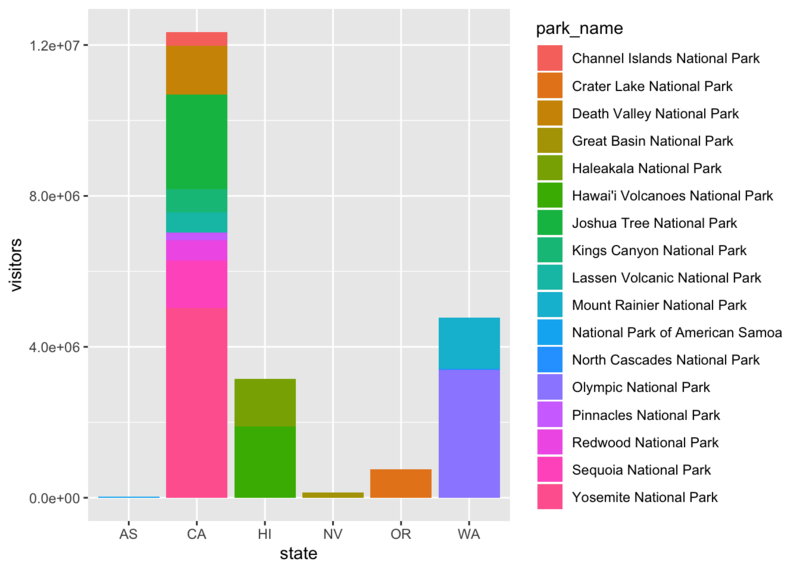 The following chart displays the total number of parks in each state within the Pacific West region. bar charts, histograms, and frequency polygons bin your data and then plot bin counts, the number of points that fall in each bin. smoothers fit a model to your data and then plot predictions from the model. boxplots compute a robust summary of the distribution and then display a specially formatted box. The algorithm used to calculate new values for a graph is called a stat, short for statistical transformation. You can learn which stat a geom uses by inspecting the default value for the stat argument. For example, ?geom_bar shows that the default value for stat is “count”, which means that geom_bar() uses stat_count(). stat_count() is documented on the same page as geom_bar(), and if you scroll down you can find a section called “Computed variables”. That describes how it computes two new variables: count and prop. ggplot2 provides over 20 stats for you to use. Each stat is a function, so you can get help in the usual way, e.g. ?stat_bin. To see a complete list of stats, try the ggplot2 cheatsheet. The stacking is performed automatically by the position adjustment specified by the position argument. If you don’t want a stacked bar chart, you can use "dodge". position = "dodge" places overlapping objects directly beside one another. This makes it easier to compare individual values. Flip the x and y axes. 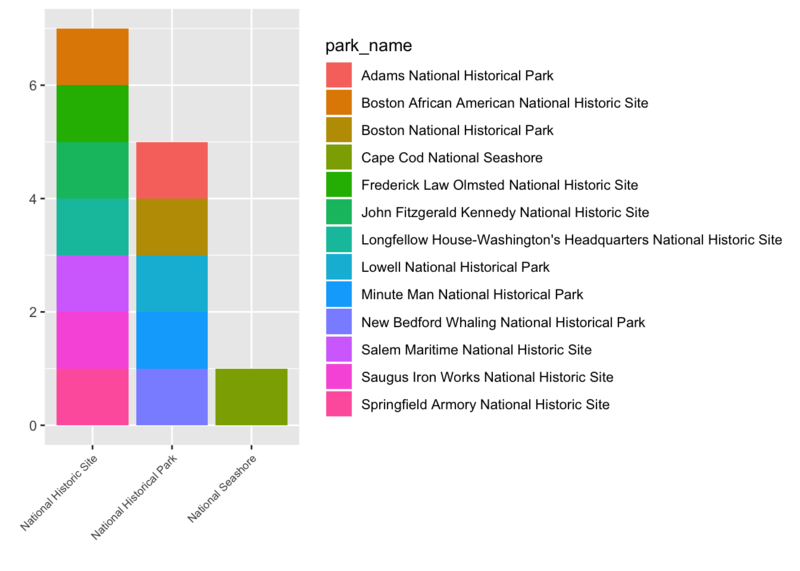 Make a bar chart using the Massachussets dataset (mass) and find out how many parks of each type are in the state. #how many of each types of parks are in Massachusetts? So as you can see, ggplot2 is a fantastic package for visualizing data. But there are some additional packages that let you make plots interactive. plotly, gganimate.